Kate Oh Gallery is excited to announce the first ever Lenticular-themed show. 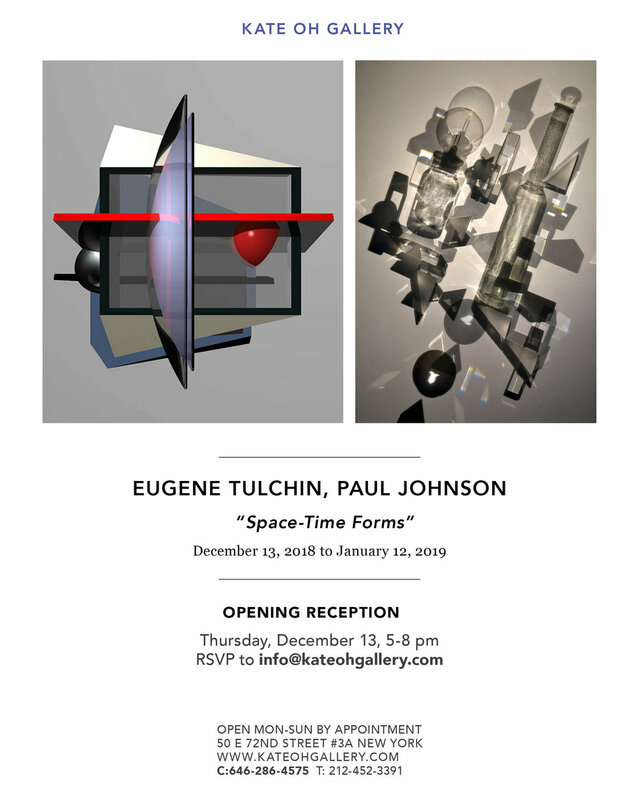 “Space-Time Forms” features works from Eugene Tulchin and Paul Johnson. Lenticular printing is when lenticular lenses are used in order to create a sense of depth within a composition, or the ability for the image to change when viewed from different angles and positions. Eugene Tulchin was born in 1934 and currently lives and works in Jersey City, New Jersey. Eugene Tulchin practices photography, computer graphics, and painting. Tulchin has had an extensive career, exhibiting widely in the U.S. and Europe, including The Museum of Modern Art as well as the Brooklyn Museum, Queens Museum of Science, Witkin Gallery, Siggraph, and numerous other venues. Paul Johnson was born in Detroit, Michigan in 1957 and grew up in Ann Arbor, Michigan. Now living in New York City, Paul Johnson works as a 3-D Lenticular photographer, and as an Emmy Award-winning director of animation and special effects. He earned in Bachelor of Fine Arts degree from The Cooper Union in 1979. After graduation, Johnson began his first career as a directing/designer of animation and special effects. He has been in the business for 25 years as an award-winning director who has worked for some of the top production companies in the business, such as R/Greenberg & Associates, and LucasArts Industrial Light and Magic. Due to his experience in animation, Paul Johnson developed his own techniques for making digital lenticular prints to create a more permanent representation of his 3-D photography. These techniques allowed him to create 3-D lenticular images for The Metropolitan Museum of Art, Top of the Rock at Rockefeller Center, and Ball-Nogues Architectural Studio. Johnson also had a solo exhibition of his 3D lenticular photography series, “Home Away From Home”, at the Ricco Maresca Gallery. Base on the Schadograph, or Rayograph techniques of Christian Schad, and Man Ray respectively, Paul Johnson developed the first 3-D Lenticular Shadowgraphs ever created. He took this technique a step further by capturing multiple recordings of the shadows of these objects over a duration of time while simultaneously moving the source of light to capture the image in 3-D. Afterwards the images are then digitally processed to make 3-D lenticular prints where as many as 120 different views of the objects’ shadows can be seen in one image without the aid of special glasses.